Most of the time I refuse to join the band wagon & knit That pattern that everyone else is knitting. Or at least I refuse to knit it while it's popular. 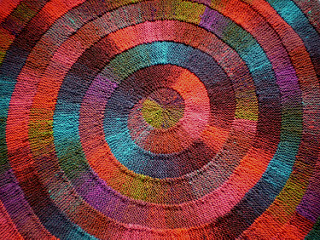 I may knit That pattern a year or two after all the hoop-la has died down, but I rarely like doing what everyone else is doing. But the popular 10 Stitch Blanket by Frankie Brown has been calling my name. 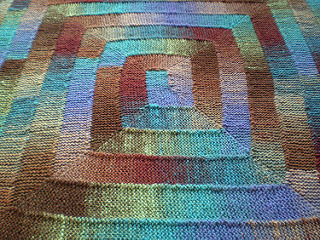 The blanket comes in several different styles, all of which are free on Ravelry. There's the round one, pictured above. There's a zigzag one and the rectangle one. Everybody is knitting the rectangle. Everybody! And for once, I wanted to join in the fun. Except, I'm still not to the half way point on my mitered square blanket. The mitered squares are knit with scrap, left over yarns and my 10 Stitch Blanket would be as well. And the thing that was holding me back from starting my own 10 Stitch rectangle blanket was... What if I run out of yarn? I would be knitting two blankets, both made with scrap, left over yarns. What if I don' have enough? What if I run out? I really do crack myself up sometimes. So I went ahead and cast on my 10 stitches and started knitting. It was fairly obvious fairly soon that something was amiss. I decided that I just didn't know what the beginning was supposed to look like and knit through another episode of Buffy. By then, there was no getting around it. Somehow, I'd missed a corner on the very first round. I hoped I could just knit a random corner into it and maybe it would be okay. It wasn't okay, but I thought I could knit a flower or crochet a granny square or something to sew over top of the center. That would surely fix it. I kept knitting. Eventually, Spike left Sunnydale and I had to face reality. It was about as likely that I could cover up that goof as it was that Spike had left Sunnydale to come find me. A bit of frogging and yet another episode of Buffy later and I'm on my way to having a nice, flat 10 Stitch blanket. And so far, I'm no where near close to running out of yarn. You crack me up, too! Run out of yarn....as if.